When you really want to spoil your ride, contact Jim’s Professional Car Detailers for an Exterior Deluxe Car Detail. Make bad traffic and long holiday drives more enjoyable! We come to you and will even add an aromatic deodoriser to your car’s interior when we finish. The Jim’s Exterior Deluxe Car Detailing team are fully insured, police checked and trained to ensure you are 100% happy with the services completed. *Prices may vary depending on your vehicle’s condition. All our prices are GST inclusive. “Both exterior and interior detailing was very well done”- Lakmali J. “Kushal detailed the exterior of my car which was filthy. He did an excellent job and I will def book in again with him.” – Janet M.
“Super happy with the result! Car looks brand new on the inside and out and all the scratches on the exterior have gone! 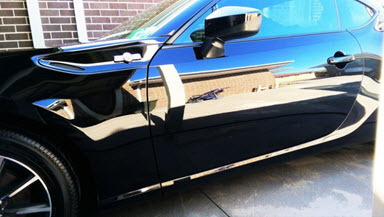 I will be recommending to o|ther people who need their cars detailed as well.”- Charlotte F.